Can the hood be adjusted by me? I find it wiggles quite a bit when driving. I can lift it about 1/4” though it is firmly latched. Would prefer I not be able to lift it at all when latched like every other car I’ve ever owned. Thanks for all the help. Lots to learn about this new little lady. It sounds more like you need to adjust the hood latch, and not the hood itself. Is it aligned with the rest of the bodywork when it is closed? How even are the panel gaps? Everything is lined up, just not snug to the car like hoods usually are. Try turning the rubber snubbers out. They can be turned by hand. Thx, will have a look tonight. Hubby has to put in my new mirror switch and put the door panel back on. I’ll have him take a look at the hood too. That worked on one side. The other one is missing. Got two new ones on order. Thanks for your help. Good to hear that you found the solution, and that it was a fairly simple one. Sometimes it is the easy solution to the problem at hand. Having the hood shake while driving is not the most ideal condition for most owners. The latch could have been... out of alignment. The body panels could have been off, the hinges could have needed tightening but the easy fix presents itself when the community lends a helping hand to an owner in distress. It's what we do here. The rubber snubbers do screw in or out for adjustments. There are also metal adjustment screws that can tighten or loosen the fitment of the hood/trunk. IF it were something else, body panels, hood re-alignment, bumper height, etc there is a PDF factory file around here someplace showing what can be done. A good coat of Dielectric grease on all rubber parts, gaskets seals is a good idea. WD-40 on latches, cables, hinge points is something I was just doing the other day. Along with evicting a chip monk from my engine bay too. You just never know... until you look. Door locks, trunk weather strips, cable lubrication here, rubber snubber adjustment there...checking the little things now, before you get busy with the summer driving season pays off. Better then having your hood fly up on you... just sayin. Glad it was a quick and easy, and not so expensive fix for you. Last edited by LAC Sky; 04-12-2019 at 11:41 AM. Got my snubbers today, went to put them in. One will go in fine but the passenger side hole for the snubber is misshapen. I will ha e to grind the metal to make a proper hole for it to fit in. Are all cars like this or is mine deformed? Both of mine have both bumpers in place, with nothing distorted. Can you post a picture? Was your car in a collision? Hard to tell without a pic, but it shouldn’t be flat. I think that the shape of your hole is OK, and I don't think you want to grind it. 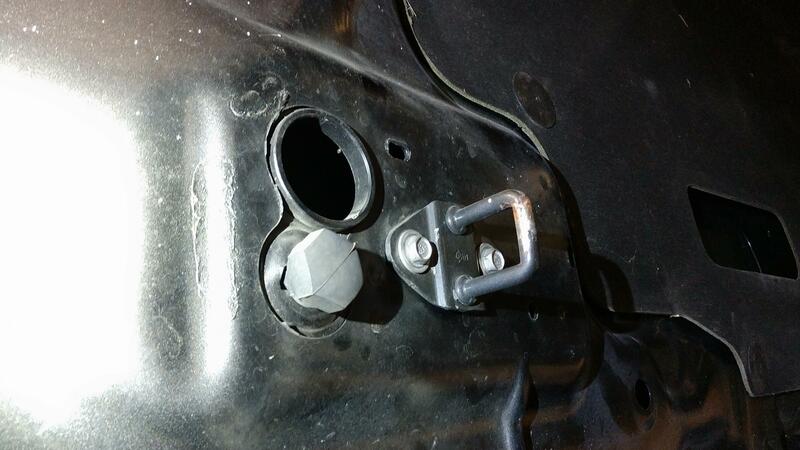 I haven't see one without the bumper in it, and didn't want to unscrew mine, but I think that the area just to the left (in the picture) directly toward the larger hole, has been pulled up and needs to be bent back down to re-form the shape of the screw thread. It definitely looks like that area took a hit of some kind. Got it sorted. It is an odd shaped hole. The other looked the same once we took the bumper out. Put two new ones in and adjusted. No wiggly hood now. I put a bead of hot glue around each bumper so they stay the way I adjusted them. Glue can easily be removed if needed. Glad you got it fixed without grinding.